25 years' experience to support your business. R&D engineers to facilitate your new design in software of Solidwork, Pro E. & NX CAM. Products are well tested and approved in Germany market. Excellent polishing procedure, Precise tooling & CNC Allwin is one of the leading manufacturers / exporter in Taiwan & China. 1. Stainless steel lost-wax products, Like railing fitting, balustrade fitting, glass hardware, Spigot & glass clamps etc. 2. Brass Hardware, Like Shower hinge, glass clip, towel bar etc. 3. Door and Window Hardware. ~ 25 years' experience to support your business. ~ R&D engineers to facilitate your new design in software of Solidwork, Pro E. & NX CAM. ~ Reply your e-mail within one working day. ~ Products are well tested and approved in Germany market. ~ Excellent polishing procedure, To provide the best high-quality finish and radius edge. ~ Precise tooling & CNC machining. 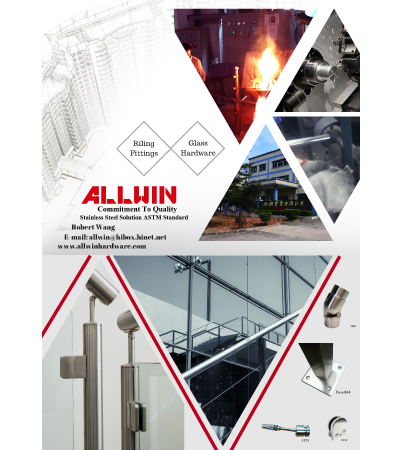 Allwin is capable of manufacturing wide range of hardware in stainless steel and Brass. Major Market : USA, Canada, European countries, Australia, New Zealand, Russia, Poland, Central and South America, Japan & Korea etc.